The National Shop Stewards Network sends solidarity to the POA union whose members took part in protests outside prisons last Friday over the massive safety concerns that the union has for their members and other staff and inmates as a result of Tory cuts. 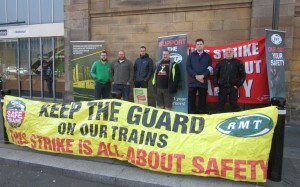 The POA have disgracefully had their democratic right to take industrial action taken from them. The NSSN is proud that they have been a longstanding affiliate of ours and we call on the whole trade union movement to stand with them. 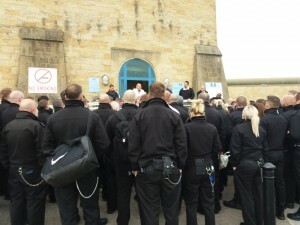 “On the 14th September 3018 thousands of Prison Officers and related grades who are POA members had a walk out in prisons in England and Wales. The POA has a permanent injunction against it by order of the High Court since last year that could lead to contempt of court and ultimately sequestration of funds if there is deemed to be industrial action. The POA do not consider the stoppage of work as industrial action but we followed legislation pertaining to health and safety at work act to ensure safety of both POA members and prisoners in our care. Inevitably we received the letter before action to threaten the union with court action but we remained committed to the health and safety at work act and therefore the action was not repudiated. The issue is the unprecedented decline in health and safety along with a decline in the security of our prisons placing both staff and prisoners at risk. No responsible trade union could stand by any longer and watch the damage done to our members on a daily basis. Over 9000 assaults averaging 25 a day on POA members an increase of 197 per cent since 2010. Prisoner on prisoner assaults 31025 an average of 85 per day up 108 per cent since 2010. The POA have been accused of acting unlawfully, recklessly and irresponsible for taking this action. On behalf of the union I refute those claims. The action was justified and necessary to protect the health and safety of my members and indeed those prisoners in our care. What is reckless and irresponsible is the budget cuts since 2010 by this Tory Government who have created the prison crisis and the violence that goes with it by reducing staff numbers by over 8000 since 2010.